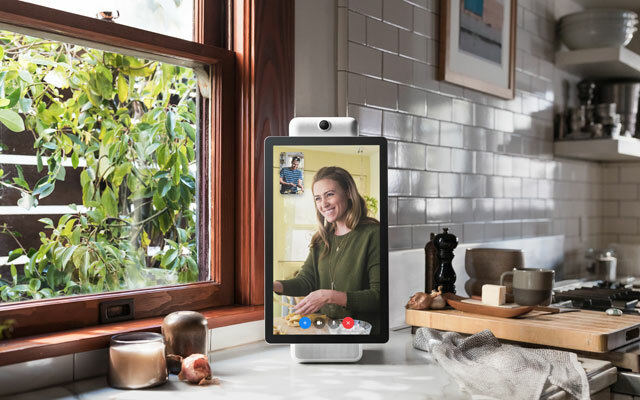 With the new Portal smart display, Facebook is trying to make video calling more like having your friends gathered in your living room. Essentially, Portal is a tablet — either 10" or 15" — with a camera, microphone and speaker, which can be voice-controlled with Alexa. 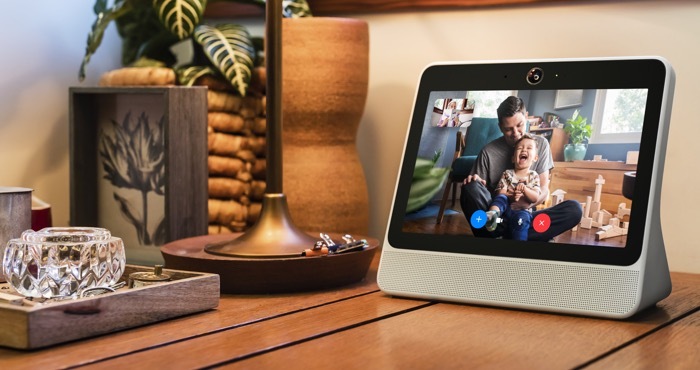 It's reminiscent of the Amazon Echo Show or Lenovo Smart Display, both of which can make video calls and a lot more besides, but Portal stands out as a video calling device with its Smart Camera and Smart Sound features. Unlike traditional video calling, where you need to sit still in front of a camera to make a call, Portal's camera has a 140-degree field of view — and it automatically pans, zooms and follows you. Being able to chat untethered makes a big difference, allowing similar freedom of movement you would have if you were all in the same room. The microphone works similarly, picking up sound from the direction of anyone on the call and minimizing background noise. The simplicity of the device makes it an excellent choice for families who may be separated by distance. To place a call, you just ask Alexa. Even elderly grandparents should be able to use it without trouble. A special Story Time mode makes it perfect for young kids: you can read a story from the screen, and Portal will add music, animations and AR effects. And, you can connect up to six people on one video call, regardless of whether they have a Portal or are using the Facebook app. What Portal doesn't do well is much beyond video calling. Despite the fact that Facebook is making these gadgets, it isn't designed for social networking. Though Portal makes calls through Facebook Messenger, it doesn't let you view Facebook or Instagram. Beyond making calls, it can play music from Spotify, Pandora and iHeartRadio (which you can listen to with friends via video chat) and play video from Facebook Watch or other partners. It can also double as a digital photo frame — but compared to the Amazon Echo Show and Lenovo Smart Display, which have a full range of tablet features, that's not much. But privacy may be Portal's biggest hurdle. You can disable the camera and microphone with a single button, and it also includes a camera cover to physically block the camera. Facebook can't listen to or view your calls, and even though Facebook is able to, it doesn't use facial recognition to keep tabs on who you're talking to. But because it's voice-controlled, it is always listening for you to say "Hey Portal," and when you do it sends your commands to Facebook for processing. These privacy concerns apply to any voice-activated smart assistant, but the question is whether you trust Facebook. The company has had a string of privacy problems this year, and just last week it revealed that the full profiles of up to 90 million users could have been viewed by a hacker. If you're considering a Portal, the question is whether you trust Facebook to maintain your privacy. The Portal comes in two flavors: the 10" Portal and the larger Portal+, which has better speakers and a 15" screen that can rotate from portrait to landscape mode. The Portal costs $199 — a little less than the Echo Show, and the same as the Lenovo Smart Display — or you can buy a two-pack for $298. The Portal+ is more expensive than any of the rest at $349, but if you want to use the device for music, you'll appreciate the improved speakers. Both are available for pre-order now and will ship in November.